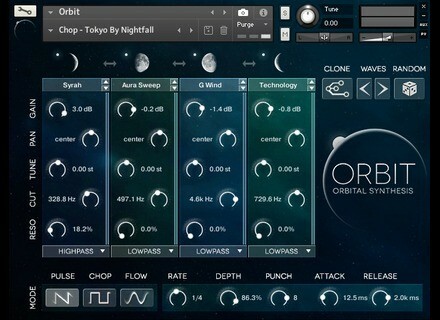 Orbit, Other Virtual Synth from Wide Blue Sound. 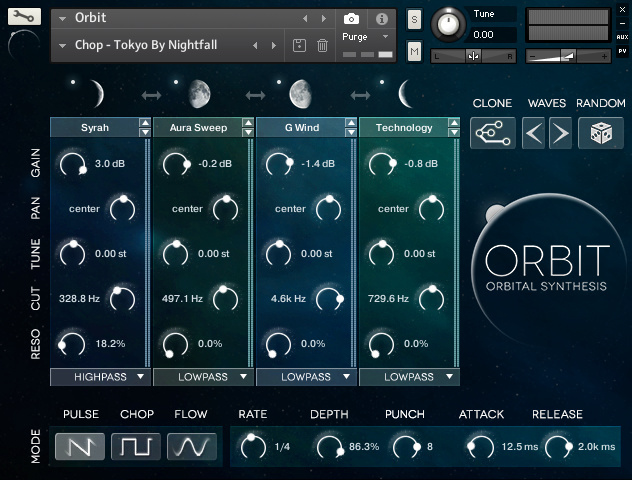 Wide Blue Sound is a brand new company that will debut next week with its Orbit synth instrument for Kontakt. Wide Blue Sound was founded by Hollywood film composer Jeff Rona and sound designer/composer/engineer Nathan Rightour. With their team, they developed Orbit, a virtual instrument for Kontakt that allows for creating rhythms, atmospheres, textures and ambiences. Orbit is based on what the team calls “Orbital” synthesis: four linked samplers turn around sounds to create pulses, hybrid rhythms or atmospheric beds. These sounds evolve and never repeat. These four sound sources (Orbits) are inspired by the cinematic world and use morphing, crossfading and time-modulated mix. Each Orbit can be programmed from 1/32 note to 4 bars and synced to the tempo of your DAW. Each Orbit also has its own pitch, level, pan and multimode filter control. The instrument uses three distinct rhythmic engines: Pulse will serve modern percussive elements, Chop for electronic styles and stutter effects and Flow for pads and textures. It will also be possible to morph these modes. Sounds are constantly evolving in all these modes, you can control the crossfader and spacing between each sound of an Orbit. Orbit also includes four 64-step modular sequencer with reverse and random playback modes, an effect section with delay, chorus, flanger, distortion and convolution reverb, a randomizer and a Clone button for a more consistent sound. It ships with 200 presets and a rhythmic pattern library. Is Wide Blue Sound reinventing the wheel? There are currently no demo, the instrument will be available on March 25th with a special introductory price of $150 instead of $200 until April 15th. Discounts will be offered to students and those who like and share the Wide Blue Sound Facebook page. More info next week at www.widebluesound.com. Test the Beta AAX version of StandardEQ SIR Audio Tools is calling beta testers using Pro Tools for the upcoming AAX version of its StandardEQ plug-in. Xils Lab launches the MiniSyn’X virtual synth With the new MiniSyn’X, Xils Lab reproduces a famous Italian polyphonic synthesizer from the 80s that used DCOs and VCF. New Cinematique Instruments Ukulele trio Cinematique Instruments introduces a new sound library featuring samples of three ukuleles for use in Kontakt.